We provide one point solution for taxi owners who have their own fleet and looking for a quick turn around software where they can manage their cars, drivers, and routes. We can help you improve your customer service and manage your taxi transfer business more efficiently. You can add as many cabs and extras as you can offer. The taxi booking script provides a simple, step-by-step booking process and an intuitive backend administration with a password-secured access. 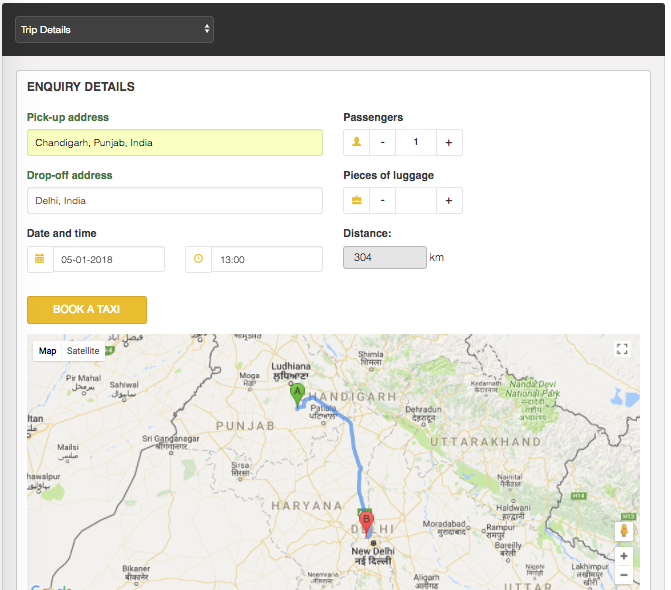 You can adjust the cab booking script according to your specific needs. Create descriptive taxi profiles and help your clients select the most suitable car for their transfer. Set passenger and luggage limits. Define start fee, fee per person, and price per mileage. Add additional services into the online cab booking backend system and allow customers to select them while making the online reservation. You can set price per service or price per person. Customers can book their preferred taxi service and pay online in less than 5 minutes – 24/7, both from home and on the go. They just need to follow the step-by-step booking procedure. Clients can pay online using PayPal, Authorize.Net or select the classic payment methods (cash, bank transfer, CC). Adjust your payment settings from the backend system. To select the pick-up and drop-off locations, customers just need to start typing the respective address and select the proper one from the suggestions. The route will be marked on a built-in Google Map. Send custom autoresponder messages via Email and SMS to both admins and clients upon a new booking, payment or cancellation. To enable the SMS functionality, you need to request an API key.